What a beauty! Found this attractive looking orange-brown butterfly, Cephrenes trichopepla, in our garden about two months ago, upon our return from a lunch date. 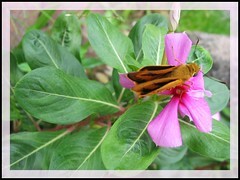 It was flitting around the Periwinkle plant, probably taking in nectar from the purplish pink blooms. But what really astounded me that afternoon as I neared it, was that it landed on my right hand, just a few inches above my wrist as if to greet my return. A pity though that I was unable to capture that precious occasion as the camera was held in the very hand it landed on! Nonetheless, I was as happy to have captured some images at all before it flew away. Yellow Palm Dart is a medium sized skipper butterfly with a broad body that is about 2 cm long, possesses large black eyes resembling gem stones and has relatively small wings that span 34-36 mm wide. 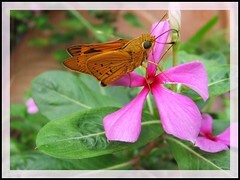 As characteristic of most skippers, it has a rapid, jerky and skipping flight, and a typical wing pose when settled, with the forewings held partially open or upright while the hindwings are laid horizontal. Both male and female have the same coloration, that is, mainly darkish brown and orange, a fabulous contrast indeed. The upperside of an adult butterfly is brownish black with extensive orange-yellow bands, while the underside is a lighter orange-yellow with dark brown dots and splotches that include a distinguishable spot near base of its hindwings. In fact, the Yellow Palm Dart is closely related to the Orange Palm Dart (Cephrenes augiades) and both species look so similar that an untrained eye can mistake one for the other (I did ;) until I researched for this article). Range: Australia and Oriental regions. Habitat: Tropical and subtropical coastal or subcoastal moist woodlands, suburban gardens, urban parks and home gardens, especially where palm trees (its host plants) are available for breeding. Food: Caterpillar feeds on the leaves of various Palm species of the plant family, Arecaceae (Palmae), which includes the Coconut (Cocos nucifera), Cabbage Tree Palms (Livistona species) and Date Palms (Phoenix species). It lives in a shelter made from joining palm fronds together with silk and feeds from therein. Amathusia phidippus phidippus (Palm King) visited our home too!